This is Ondeh Ondeh with Sweet Potatoes, a popular tea-time snack in Malaysia. There are two varieties of this snack. One made completely with glutinous rice, which I had posted earlier and you can find the recipe here. Whilst the other recipe is made with a mixture of sweet potatoes and glutinous rice flour, which is what I am posting here today. In any case, if you plan to make this delicious snack, do adjust the flour according to the sweet potatoes’ texture. Some tubers’ might have very soft or fibrous flesh. Add more flour if it’s too soft, of course. Just remember that the dough is supposed to be very soft and slightly sticky. So, have fun making them. Boil the sweet potatoes in a medium pot until tender, 20 to 30 minutes, depending on size of potatoes. In a large bowl, combine the sweet potato with glutinous rice flour, all-purpose flour, and Pandan extract and knead well to form a soft dough. Mix the grated coconut with a pinch of salt and steam for about 2 - 3 minutes and let it cool completely. Bring a pot of water to boil. Pinch a small piece of dough (about 15 g each) and flatten lightly. Fill the center of the dough with palm sugar. Roll them in your palm to form a smooth ball and cook the ondeh ondeh in the boiling water. When the ondeh ondeh float to the surface, remove them with a slotted spoon and shake off the excess water. Coat the ondeh ondeh with grated coconut and serve immediately. Mmmm....Yum! Chewy little morsels. Just so Malaysian! An if you use yellow or purple sweet potato, the balls would have been coloured brightfully naturally! Pumpkin works great too! Wow they look very tasty! Yum! 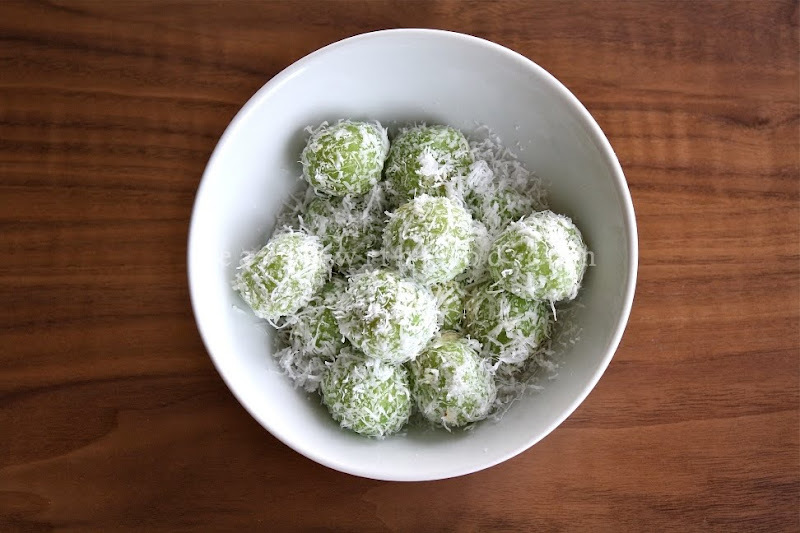 wow this is the 2nd onde onde post i saw today! I wonder if it's a sign lol.. Never knew onde onde was made with sweet potato till today..
Yummy tea-time snack morsels. 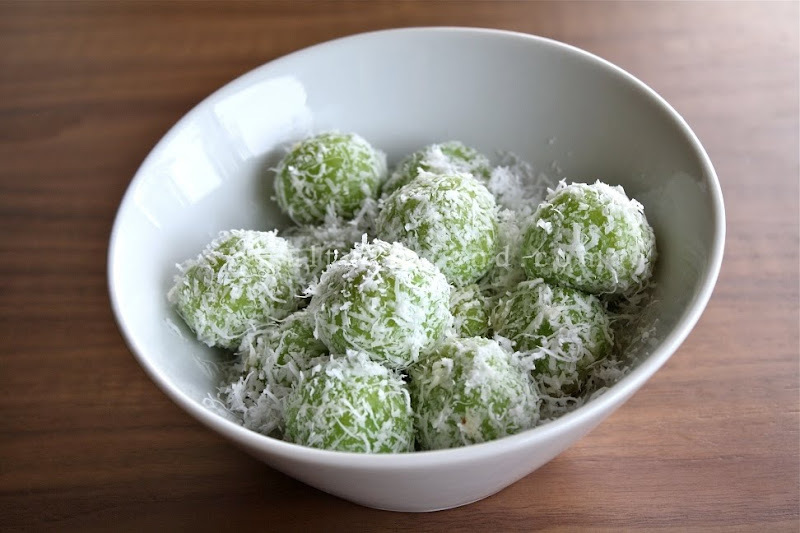 I love onde-onde but have yet to make the sweet potato version. I've have to try this soon as I still have about 5 blocks of gula melaka left in my fridge. Great pictures by the way. I am fascinated by this dessert, never heard of it before. Putting this on my to-try list. Beautiful photos!